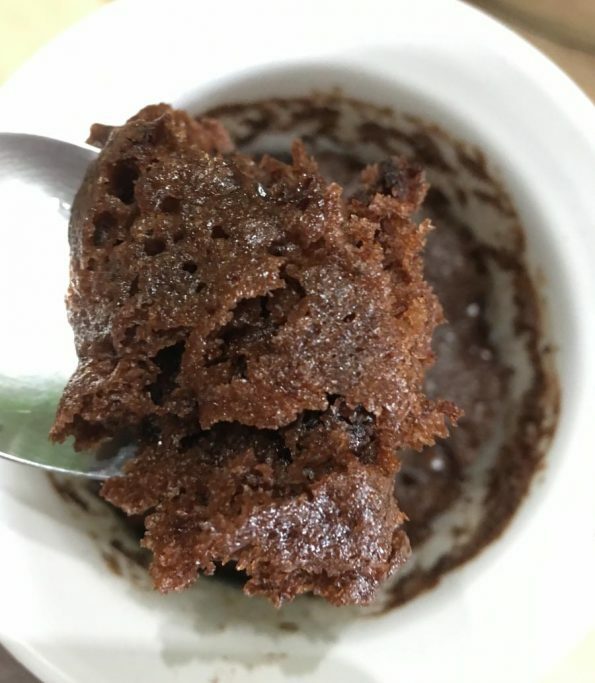 This eggless chocolate mug cake recipe using yogurt and semisweet chocolate chips is soft and moist with gooey texture inside. 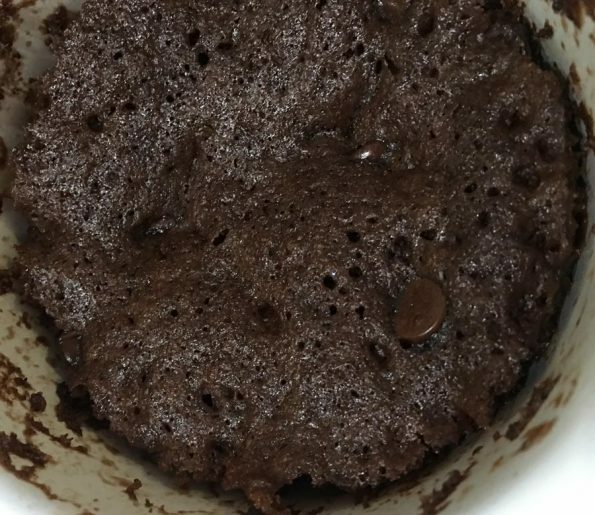 You can make soft and moist egg chocolate mug cake using microwave in no time and it is so delicious. 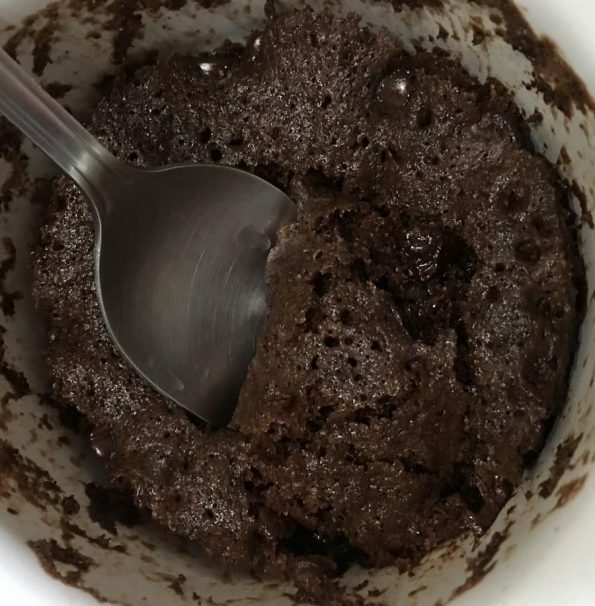 So if you want to make a really quick, easy chocolate mug cake when you don’t have any eggs in the kitchen, try this delicious eggless chocolate mug cake recipe to make the most delicious, gooey and moist chocolate mug cake with semi sweet chocolate chips. 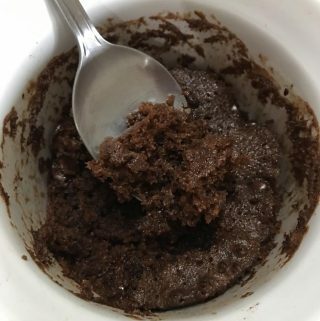 We also use cocoa powder (along with the chocolate chips) to make this chocolate mug cake which makes a perfect one serving dessert who wants to enjoy a quick, easy, delicious chocolate dessert. 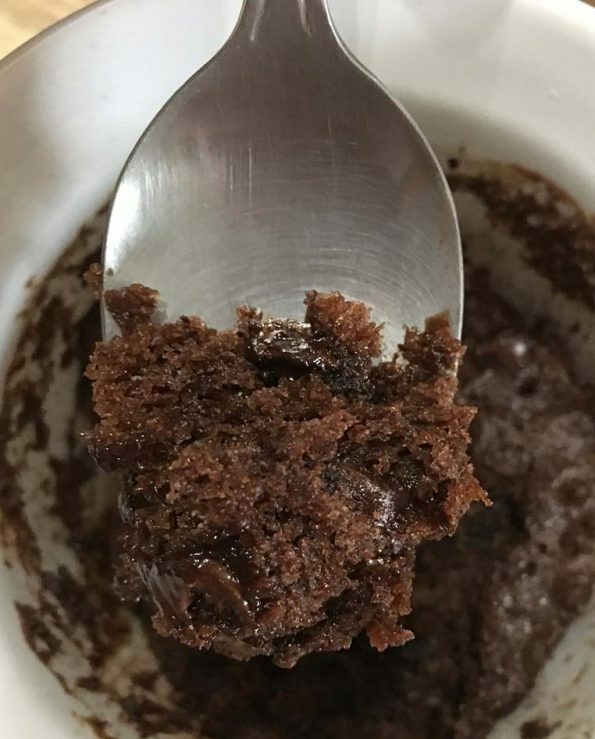 The addition of semi sweet chocolate chips and yogurt is what that makes this mug cake so moist and delicious with a gooey texture inside. 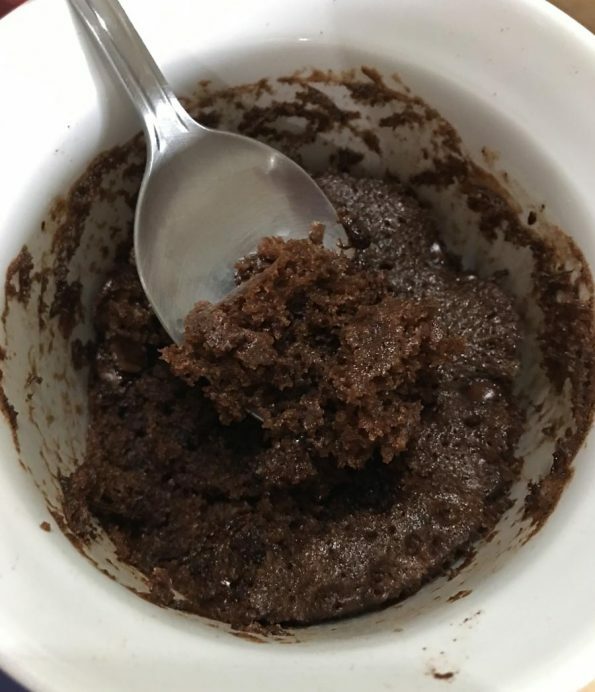 If you like eggless chocolate mug cake recipes, try this prunes chocolate mug cake recipe (with oil) and this oil free prunes chocolate mug cake recipe which are all delicious microwave chocolate mug cake recipes. 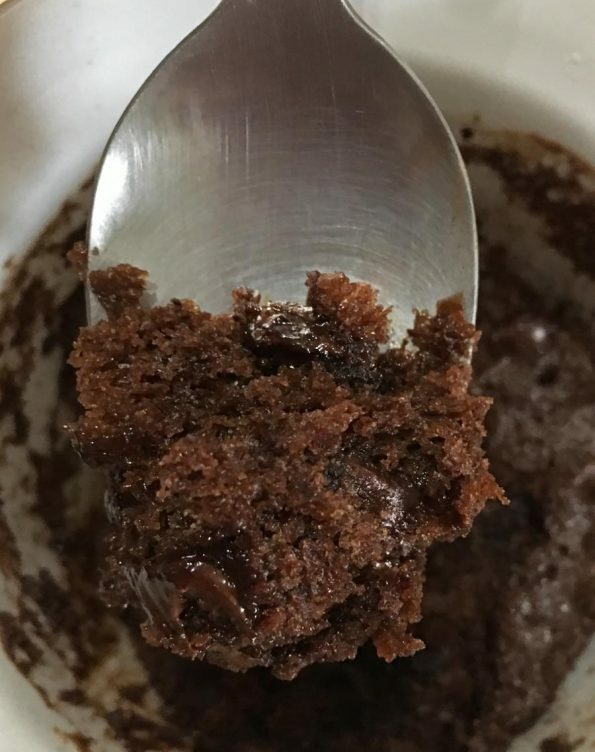 Easy soft, moist, gooey chocolate mug cake recipe in microwave without using eggs. 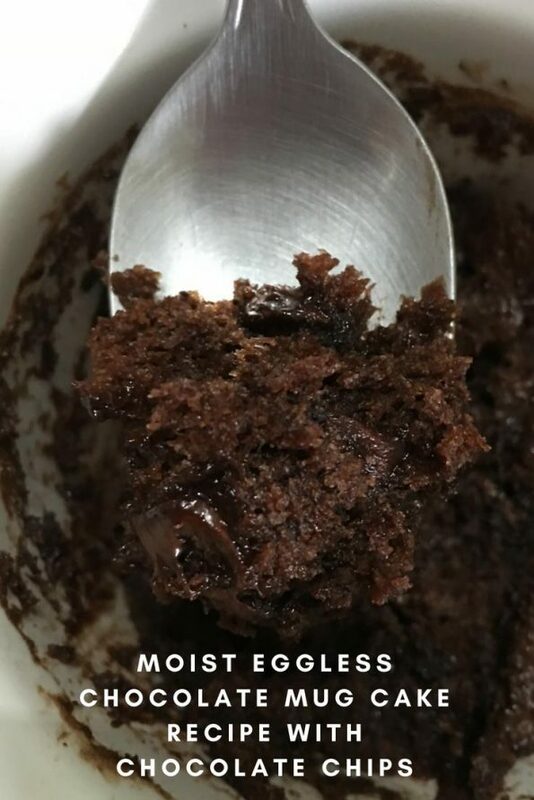 This eggless chocolate mug cake recipe uses yogurt and semi sweet chocolate chips which make this chocolate mug cake very moist and delicious. In a microwave safe mug, mix together the dry ingredients - flour, cocoa powder, baking powder and baking soda until they are evenly mixed. Add the yogurt, sugar and vanilla essence to the mug, stir well and mix the batter without any lumps (make sure to use smooth yogurt without any lumps). Add two tablespoons of semi sweet chocolate chips and oil also to the mug, stir everything well so the oil and chocolate chips get mixed with the contents evenly. 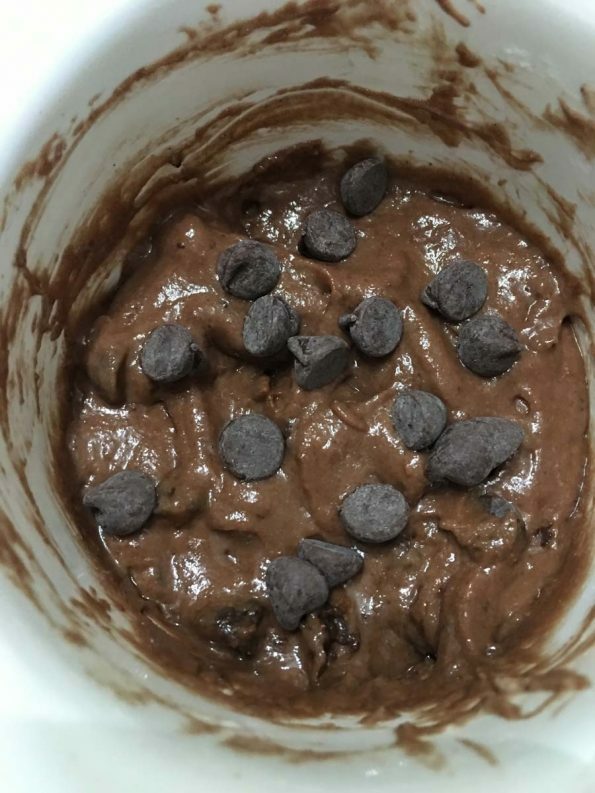 Top with the remaining one tablespoon of semi sweet chocolate chips and microwave in high powder for 3 minutes until the cake is cooked and soft. Allow the cake to cool down and enjoy the delicious chocolate chip mug cake! 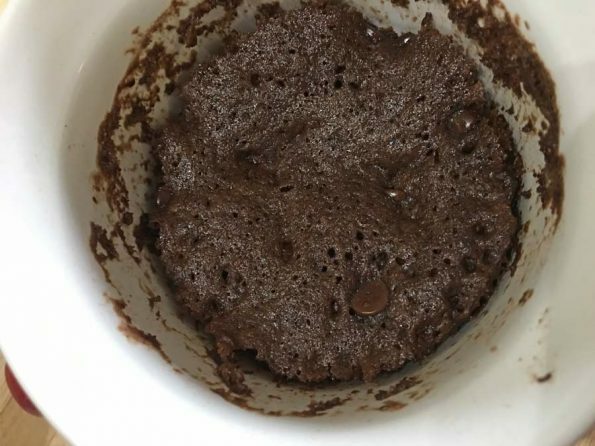 Hope you found this post on chocolate mug cake with chocolate chips helpful in making easy and delicious chocolate chip mug cake for a quick, easy and delicious dessert!